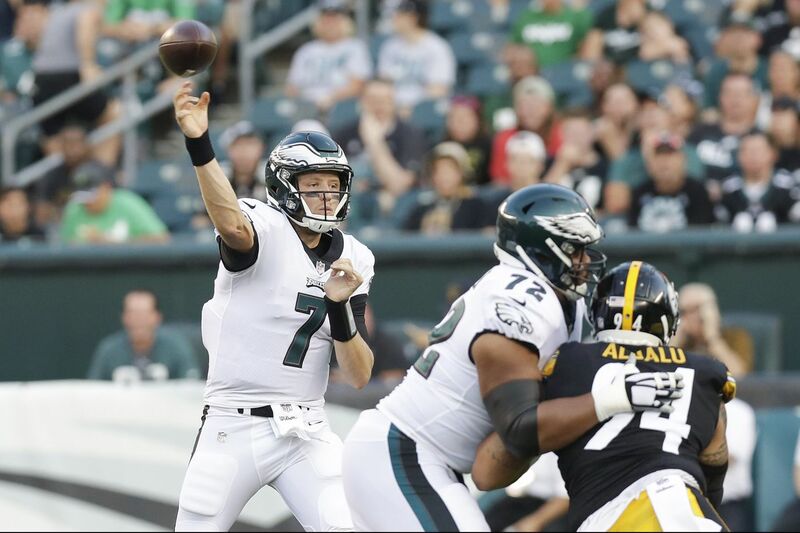 Eagles quarterback Nate Sudfeld throws the football as offensive tackle Halapoulivaati Vaitai blocks Steelers defensive end Tyson Alualu during the first quarter of the Eagles' 31-14 preseason loss on Thursday. What is Nick Foles worth? It's a question that the Eagles contemplated this offseason as they gauged the trade market for the Super Bowl MVP, and it's one that could arise again between now and Week 1. Part of the answer to that question lies on the demand side of the market, where Foles' value is whatever a team in need of playoff-tested starter is willing to pay. But another part is something that only the Eagles themselves can decide. What is Nick Foles worth to us? It was a pertinent question to consider during the preseason opener Thursday night, because a significant variable in that equation happened to be the man who was starting under center. Nate Sudfeld is a quarterback who spent most of last season enjoying the kind of anonymity that can be rare at his position. There's a reason the Eagles were willing to give him an active roster spot rather than letting the Colts sign him off their practice squad. There's also a reason they didn't spend their offseason auctioning off Foles to the highest bidder. In between those two reasons stands a 24-year-old quarterback who should get plenty of opportunities this preseason to affect the Eagles' calculations. Ever since the Redskins drafted him in the sixth round in 2016, Sudfeld has offered NFL talent evaluators an intriguing combination of size and arm strength to project into the future. The Redskins kept him around as a third quarterback during his rookie season, then placed him on waivers at the end of last year's training camp, hoping to sign him to the practice squad. Instead, the Eagles swooped in, convinced that a team can never have too much potential at the sport's most important position. Since he first arrived at the NovaCare Complex last September, Sudfeld has solidified himself as a legitimate developmental prospect who might someday serve as Carson Wentz's top backup. The question that this preseason will begin to answer is how close he is to that point right now. Against the Steelers, you saw a little bit of everything that would make any opportunity to trade Foles a near-impossible conundrum. On his third snap of the game, Sudfeld made the kind of throw that, if multiplied, can quickly end a team's season. He dropped back and spotted Greg Ward but not the zone defender on the other side of him. "It was a bad read," Sudfeld said. "Bad read. I thought it was a different coverage than it was, and tried to play fast. Put it out there, the corner came off, and, yeah, I wanted to bury my head in the ground after that one." Later in the game came another mistake, this one less egregious, an airmailed throw into single coverage that, again, was easily intercepted. Yet in between these mistakes were a number of moments that exemplified the potential the Eagles see in Sudfeld. His 63-yard touchdown pass to Shelton Gibson in the second quarter was the kind of toss that most No. 3 quarterbacks simply cannot make, a beautiful rainbow spun 40-plus yards in the air and dropping perfectly over the receiver's inside shoulder. This came after another touchdown pass in which he shimmied away from front-side pressure, kept his eyes down field, and rocketed a strike into the chest of Dallas Goedert. There were other moments that left little doubt about Sudfeld's physical capabilities, including a level of mobility that can at least neutralize some trouble. Beyond his two interceptions, he threw just two other incompletions, finishing 10 of 14 for 140 yards. The performance offered another solid sample that can't help but factor in to any future decision making. The first such test-run came in last year's regular season finale, with the Eagles facing the Cowboys in a game that had zero playoff implications. That day, Sudfeld completed 19 of 23 passes for 134 for yards, a meager 5.8 yards per attempt, but with no interceptions. As for Thursday, it was interesting to note something that happened after Sudfeld's first interception. After jogging off the field in frustration, the young quarterback beat a straight path to a specific spot on the sideline. There stood a familiar face wearing a ballcap and street clothes. Sudfeld and Foles spent the next few moments discussing everything that had happened, from what he thought he saw on the play to the reality as it unfolded. For lessons like these, repetition remains the most effective teacher. But it can't hurt to have another voice adding guidance to the process. "Obviously, Nick and Carson have had a lot of success in this league," Sudfeld said, "so just being able to bounce thoughts off them and talk to them about what I saw or the reasons for what I was doing, or what I'm missing — they're great sounding boards." What is Foles worth on the trade market? At this point, it's hard to imagine that it's anything close to what he is worth to the Eagles. A first or a second, sure, but anything beyond that might drift into the red on risk-and-reward. That's not a knock on Sudfeld, but, rather, the reality of the peace of mind that the team would sacrifice without Foles on it.